Precision and reliability in time measurement for every situation: those are the core subjects of any watch taken aboard an expedition that is going to set out for an exploration of the boundaries of the world. During its whole history of 177 years, Jaeger-LeCoultre has dedicated itself to pushing precision and reliability to the highest possible levels in horology. Compressor Extreme LAB 2 Tribute to Geophysic, a mechanical Chronograph with GMTfunction, especially developed for use in the most extreme environments. This model is a rightful heir to one of the manufacture’s emblematic watches, the 1958 Chronomètre Geophysic. As such, it has an undeniable link with the Master Compressor line, which in the house of Jaeger-LeCoultre stands for die-hard-sports watches with innovative functions and thoroughly tested mechanisms – outfitted with state of the art technology, the latest in materials science and watchmaking development. clearly visible power reserve and a GMT-function make this chronograph a step forward in the development of horology for real life usage – anywhere. All this is housed within a rugged watch case with external chassis, made of the light and extremely resistant TiVan15 titanium alloy and outfitted with a scratchproof high tech zirconium ceramic bezel. Specially designed, easy to use push buttons guarantee failure free use even when wearing gloves and an innovative interchangeable strap system with double pin buckle makes changing straps fast, easy and safe. To test their ambitious project, Jaeger-LeCoultre has sent the Master Compressor Extreme LAB2 Tribute to Geophysic out into the wild with a mountaineering expedition called “Expedition Geophysic” to conquer a virgin peak in the Himalayas, which has been christened the Mount Antoine LeCoultre. Throughout its history the company has proven its mastery of watchmaking, as a science as well as an artful craft. The Master Compressor Extreme LAB 2 Tribute to Geophysic with its second time zone has to be a trustworthy companion during months out in the field with no chances taken that could adversely affect its timekeeping. For this reason, the watchmakers of the manufacture have come up with some features that simplify its handling whilst at the same time guaranteeing utmost precision. In order to keep the movement running, even when time or date has to be set, they developed a function selector in combination with an extra, manually engaged, stop seconds button. This system makes pulling the crown superfluous and therefore protects the watch from possible intrusions of dust and dirt for the crown stays in the same position at all times. Because of this construction, it was technically impossible – and unnecessary – to secure the crown with a Compressor-screw. Instead it is protected by the two chronograph pushers at the sides and sealed with a double gasket system. While the time is being set via the function selector, the seconds hand doesn’t stop so that it cannot affect the precision of the watch. If however the watch has to be set to a timing signal, the user simply operates the slider located on the left side of the case. By sliding it up and then pressing it, the seconds hand stops and upon releasing starts again. This double sliding-pushingfunction prevents the slider from being activated accidentally. The functions of any wristwatch rely of course on the power supplied to the movement. The winding barrel of the Master Compressor Extreme LAB 2 Tribute to Geophysic provides 60 hours of constant energy to drive the watch movement. Nevertheless, for perfect reliability the user must be able to quickly view the state of the power reserve level so that the watch’s timing will not be negatively affected. The state of the power reserve can be observed through a newly patented, intuitive and clearly visible semicircular radial power reserve indication surrounding the upper half of the dial. If the power reserve nears its end, the red color will fill the half circle. After winding, it re-initiates to black – clearly indicating the state of the winding barrel. The designers chose this unique and large display to allow for one glance monitoring of the state of the movement even under inclement weather conditions or use in twilight. In long-term timekeeping during endurance activities – such as mountaineers timing their ascending-plan – the stop-minutes counter is at least as important as the stop seconds hand. For better readability at a glance, the designers decided on the following layout of the dial: At 12 o’clock a window shows a patented jumping digital minute counter for clear readability of the chronograph function. It works on the basis of an instant jumping mechanism that is activated precisely at the point the seconds hand passes the zero-mark. The central stop-seconds hand shows the seconds passing in a traditional way. Whereas the chronograph’s hour counter runs in the same sub dial as does the small permanent seconds – as indicator for a properly working movement. The Master Compressor Extreme LAB2 Tribute to Geophysic is a chronograph combining sporting spirit and technical prowess into a resolutely extreme design, with a maximum of comfort, readability and ergonomics. High tech materials and daring shapes combined with the sandwich structure of the case, transforming the watch into a state-of-the-art timing instrument. The black zirconium ceramic bezel together with the sapphire glass forms an almost indestructible upper section. For the casing the designers came up with a bipartite carrierconstruction for the Master Compressor Extreme LAB 2 Tribute to Geophysic in which an outer carrier holds the bracelet and simultaneously forms the frame for the inner watchcase that houses the movement itself. This system delivers a maximum of sturdiness combined with a minimum of weight; which is especially true since the watchmakers chose an exceptional titanium alloy called TiVan15 as the case material. In this alloy made of titanium and Vanadium extraordinary physical resistance to tension, torsion and scratches is improved by 15% compared to traditional titanium alloy. The case-construction itself exudes a sporty no-nonsense look befitting its use under all kinds of tough environments. This casing solution – inspired by the Master Compressor Extreme LAB – delivers maximum ergonomics. An innovative pushbutton construction makes sure that the watch can be easily handled in any situation. For this reason, the pushbuttons themselves are protected by large Lshaped metal arms, which are fixed at one point in the case close to the crown, thus forming a large contact surface for better ergonomics and simultaneously providing superior protection for the crown with its built in function pusher. The front areas of the pushers are covered with rubber pads to ensure slip-free usage in any weather condition – even with thick mountaineering-gloves on. The open worked dial allows one to admire a clear view of the movement’s structure through the sapphire crystal, while the movement part’s black PVD-coating provides a high contrast with the luminous indexes and newly designed skeleton hands for a maximum of readability in any situation. The newly developed Calibre 780 reflects the mastery of Jaeger-LeCoultre’s watchmaking in full bloom. Even with the complexity of 569 parts, it remains a precise and reliable movement with chronograph and GMT functions in which the latest of the manufacture’s developments have been incorporated. With its range of application in mind, sports and exploration, the watch is built to resist extreme conditions – from the boiling heat of hot deserts to icy storms on high mountains – thereby delivering the highest possible levels of precision and reliability. 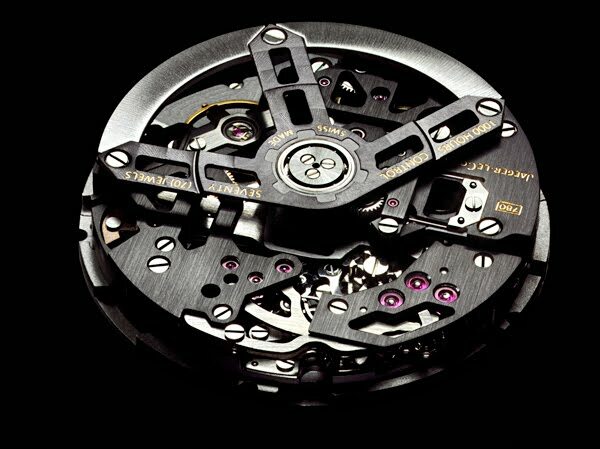 For the watchmakers at Jaeger-LeCoultre such a development does mean more than just big casing and thick sapphire glass: The experts decided on creating a check list on how to tackle the issue of ruggedness from the very interior of the movement. The Jaeger-LeCoultre Calibre 780 is a chronograph with its function regulated by a column wheel, where precise start- and stop functions are guaranteed through a vertical clutch system. As it is specially designed for long-term measurement of events (such as timing of mountaineering ascents), the watchmakers and designers decided upon a digital minute counter which they placed in a clearly visible 12-o’clock-position on the dial as mentioned above. For an explorer’s watch, a second time zone is a must – and as such a main feature of the Master Compressor Extreme LAB 2 Tribute to Geophysic. As a tradition for Jaeger-LeCoultre movements, the second time zone – the home time – is indicated by a second hour hand from the center, with a 24-hour indication at the 6 o’clock position. It can be adjusted through the crown after pushing the function selector twice and then turning the crown to set the hour hand. The large balance wheel has a moment of inertia of 11.5 mg cm2, enough for it to beat at a steady 28,800 v.p.h. with only minor disturbances in case of shocks. It is equipped with variable inertia screws. No index is used to adjust the beat-rate, for it could slip from position after a shock. The stud holder is held by two screws, which – once set – are fixed under all circumstances. The hairspring itself has a special protection device that limits the motion of the spring during periods of extreme situations, such as shocks. The balance bridge is fixed on two support points for extra strength. As for its performance, the automatic rotor, mounted on lubrication free ceramic ball bearings, winds the barrel of the watch unidirectional to a maximum of 60 hours of power reserve. All components of the movement are highly decorated or PVD finished and of course, the watch has endured Jaeger-LeCoultre’s demanding 1000 hours test to certify its reliance under all conditions. A newly designed interchangeable strap system is operated by lifting a small covering on the case back behind the strap. Through sliding it open the straps can easily be changed. The double alligator strap stand for the highest possible reliability and a patented notched binding system allows perfect ergonomics. The double pin buckle enables the wearer to fine-tune the strap length even in the distance between two holes. The Manufacture Jaeger-LeCoultre launches a second exclusive model which distinguishes itself from the first one on the outside. It has an 18-carat pink gold chassis to hold the TiVan15 watch case, which makes it the more glamorous of the two watches – but heavier as well. This watch case – due to its use of precious metals – provides a different surrounding for the high tech movement and the red gold chassis clearly indicates that the watch is dedicated to a more modest usage in less harsh conditions. This version make it the perfect choice for any adventurer who longs for a bit more glamour on his wrist. Research technologies and tools had advanced greatly in the 1950’s, allowing scientists a scope of investigation without precedent. With cosmic ray recorders, spectroscopes, and radio equipped balloons, the upper atmosphere could be reached for exploration, while the first electronic computers were able to analyze large data sets and the use of rockets allowed a glimpse into the world high above the surface. However the data culled from these experiments most often proved insufficient for scientists to proceed with their research. Calls for more, better and improved data of the earth’s boundaries in 1952 led the International Council of Scientific Unions to the proposing of a series of global geophysical activities in the period from July 1957 to December 1958. The idea of the International Geophysical Year (IGY) was born: To measure the world. And it intended to allow scientists from around the world to take part in a series of coordinated observations of various geophysical phenomena. 67 countries had become involved “to observe geophysical phenomena and to secure data from all parts of the world; to conduct this effort on a coordinated basis by fields, and in space and time, so that results could be collated in a meaningful manner”, as the American National Academy of Sciences stated. IGY activities spanned the globe from pole to pole. Much work was carried out in the arctic and equatorial regions. IGY research contributed to improve meteorological prediction, advances in glacier- analysis and understanding of seismological phenomena. The most sensational of scientific work were the space programs of the USA and the USSR: Sputnik 1 and the establishment of the NASA are vivid reminders of the International Geophysical Year. In the spirit of those advances in geophysical sciences, Jaeger-LeCoultre developed the Chronomètre Geophysic. It was intended to perfectly suit the demands of that day’s researchers, whether on polar stations or in laboratories, the watchmaker’s idea was to provide a watch that could withstand all trials. Therefore the chronometer worthy timepiece was equipped with a casing to make it resistant to magnetic fields, water and shocks. This was honored by the City of Geneva, which choose the watch as a presentation gift in 1958 for two US citizens for their contribution to the IGY: Chosen were two men that by all mean pushed the borders of knowledge and proved the unproven: the commanders of the submarines U.S.S. “Nautilus”, the first submarine to complete a submerged transit across thNorth Pole, and U.S.S “Skate” that operated under the North Pole ice, surfacing nine time through the ice and became the second ship to reach the Pole. With its new Master Compressor Extreme LAB 2 Tribute to Geophysic, Jaeger-LeCoultre not only shows its mastery in the creation of sporting watches for extreme conditions, the manufactory also pays tribute to its own heritage and has taken a big step in the quest for the perfect rugged timepiece suitable for exploration. When in 1958 Jaeger-LeCoultre launched the Chronomètre Geophysic, the mother of all rugged sports watches from the Grande Maison, the quest was opened on how to design a watch that would suit the demands of scientists and engineers, who long for a timepiece with outstanding precision and performance even in the worst surroundings. Jaeger-LeCoultre answered with the creation of the Chronomètre Geophysic, a water-resistant wristwatch that withstood magnetic fields as well as an outstanding shock resistance system. However, this was only the beginning. In 2002, Jaeger-LeCoultre took up the idea of sports watches in a new line called Master Compressor, in which it chases the pinnacle of rugged watches with up-to-date technical innovations: In 2002 the Master Compressor with compression keys for easy and secure locking system of the crown was launched; in 2005 followed the Master Compressor Extreme with inventive shock-absorber system; 2007 Jaeger-LeCoultre reopened the field of diver’s watches with a mechanical depth gauge in the Master Compressor Diving; 2007 they revealed their state of the art in mechanical watchmaking with the lubrication-free movement of the Master Compressor Extreme LAB, a movement housed in a specially designed, shock-resistant case – the first ever watch to eliminate the problems of temperature-sensitivity of watchmaking-oils. And therefore another giant step towards the perfection of timekeeping. Some of those watches have accomplished exceptional achievements in extreme conditions. The Master Compressor Diving GMT for example went down to a depth of 1,080 meters off the coast of Hawaii, pinned to a submarine to prove its sturdiness in a place where no diver can go. In the spirit of this watchmaking past, Jaeger-LeCoultre, even before the launch of the new Master Compressor Extreme LAB 2 Tribute to Geophysic, proves the watch’s sturdiness by sending it to the great outdoors, celebrating the spirit of its ancestor and the extraordinary functionality of its Master Compressor Extreme Line. In the autumn of 2009, as a tribute to Geophysic, Jaeger-LeCoultre outfitted the “Antoine LeCoultre Expedition” consisting of three exceptional mountaineers, set out to conquer a virgin summit in the Himalaya. The Master Compressor Extreme LAB 2 Tribute to Geophysic was one of the three timepieces that guided the alpinists to the summit. The team consists of renowned Swiss climber Stephane Schaffter and the Pakistani Sherpa Little Karim and the Nepalese world famous Apa Sherpa, who tackled the Mount Everest 19 times. They set out to climb a technically highly demanding 6589 meters peak in the backyard of Mount Everest. After a grueling climb – at the base camp already they had to force themselves through over 40 Centimeters of newly fallen snow – and under constant thread of avalanches, they reached the peak on the 22nd October 2009. To honor history and high horology, they then christened the Mountain “Mount Antoine LeCoultre”. For the climbers, who rely on the precision of a 1958 Chronomètre Geophysic watch as well as a Master Compressor Extreme LAB and the new Master Compressor Extreme LAB 2 Tribute to Geophysic, the aim is not only to reach the summit, but to do so in the adventurous way of traditional “fair means” – classical mountaineering style. This concept of course fits neatly into Jaeger-LeCoultre’s tradition to combine the classical concepts of horology with modern technology for the demands of today’s world. The Jaeger-LeCoultre Chronomètre Geophysic launched in 1958, has set off the Master Compressor line with its credo of the watch was “shockproof and water resistant” –technical features that can all be defined as 100 percent the goal of any Master Compressor timepiece. With today’s new Master Compressor Extreme LAB 2 Tribute to Geophysic, Jaeger-LeCoultre proves impressively that its watches are made for the extremes, a field requiring technical mastery, innovation spirit and high watchmaking – precisely the DNA of the Master Compressor line. Master Compressor Extreme LAB 2 Tribute to Geophysic: Technical characteristics The new Master Compressor Extreme LAB 2 Tribute to Geophysic is a mechanical Chronograph with GMT-function, especially developed for use in the most extreme conditions. The chronograph has a digital number display and a radial power reserve for easy readability. 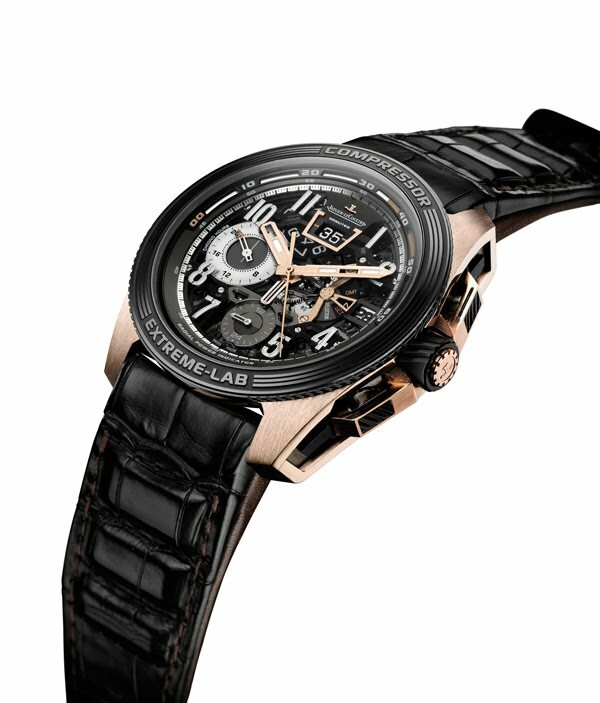 As a member of the Master Compressor line, which stands for die-hard-sports watches with innovative functions and thoroughly tested mechanisms, the Master Compressor Extreme LAB 2 Tribute to Geophysic is outfitted with state of the art technology, the latest in materials science and watchmaking development.